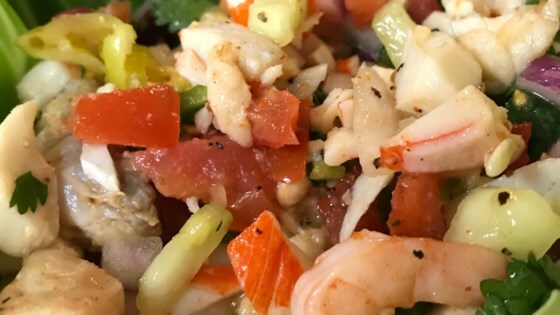 "If I were ceviche, I would want to be this recipe for its flawless simplicity and popular appeal! Although this recipe says it serves six, two of us polished off the whole bowl, no problem! Goes great topped with a dash of your favorite hot pepper sauce." Dice shrimp and place in a mixing bowl. Squeeze lime juice over shrimp until they are completely covered, about 4 limes. Stir in the tomatoes, onion, cucumber, serrano peppers, and salt and pepper. Cover, and refrigerate 1 hour. When ready to serve, adjust seasoning with salt and pepper as needed. Serve on top of tostada shells with a splash of hot sauce, if desired. See how to make spicy, citrusy shrimp and scallop ceviche, Mexican-style. Delicious - only change was we added 1 ripe, cubed avocado. I have waited so long to make ceviche and this recipe was perfect. Very easy to make and it was absolutely delicious. I make it at least once a week now. Made this for work and everyone loved it!! Too spicy and tart to eat the night I made it, but by the next day all the flavors had blended and mellowed perfectly. Perfect recipe! I made this for a party and everyone loved it!!! !